I am so proud and humbled to be able to formally announce that Upfront Ventures has raised its 6th venture capital fund in the past 21 years. Upfront VI is our latest core fund and is $400 million to invest in early stage entrepreneurs. This brings our combined funds under management to nearly $2 billion. A huge thank you to all of the Limited Partners who have entrusted us with your capital, time and reputations. We take this commitment and relationship very seriously and expect a great decade ahead. So what does one actually do with $400,000,000? As you probably know we are based in Santa Monica and as my partner Greg Bettinelli coined, we’re #LongLA. If you watch the short video below you’ll have a great sense on what is uniquely LA in 2017 — hearing from Mayor Garcetti, Kobe Bryant, Tyra Banks, Baron Davis and so many great advocates for the uniqueness of our city and some of our key stats. There’s no doubt in my mind that “LA is having a moment” and both VCs and LPs realize it. LPs (the people who invest in VC firms) have clearly voted in favor of LA with the creation of 15+ new early-stage venture firms and the continued growth is size and team of the great larger firms that are well established. Increasingly local entrepreneurs are finding they don’t have to “take the trip up North” quite as often because on a weekly basis venture firms are down in LA — it’s only an hour’s flight. But there is clear evidence that the overwhelming majority of startups will raise their first dollars from LA-based venture capital funds. We hope that having a larger fund ourself will mean that fewer need to take the trip even as their capital needs grow. As our brand makes clear, we’re early stage venture capital investors. 88% of the deals we do are Seed or A-Round investments and our median check size is $2.8 million. We don’t mind investing earlier if the situation warrants and we don’t mind leading a B-Round if we know the team well or the market. We’ll invest in about 15 new companies every year or just over 2 per partner. Overall we write about $100 million of investment checks every year. 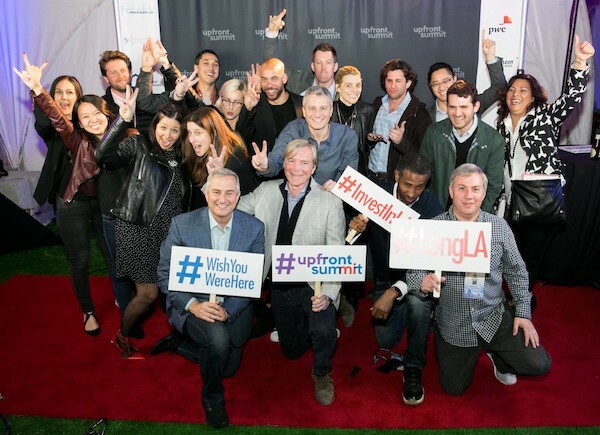 At Upfront we’re six full-time investment partners and a whole cast of additional team members that support the work we all do and work directly with portfolio companies to be helpful. The investment partners are Yves Sisteron (the founder), myself, Greg Bettinelli, Kara Nortman, Kobie Fuller & Kevin Zhang. And Stuart Lander is also a partner and runs all operations and platform teams. And anybody who works with us of course knows Kerry Bennett who runs marketing and our CFO Dana Kibler. My partner Kara said it best, “We all have different UI’s but our back end’s are all the same,” which she explained as — we have different personalities but we all have the same value system and work ethic. I love how our whole team really works towards common goals and with the same sense of purpose. We’ve truly evolved into a cohesive partnership and a full family at Upfront who have now worked together for years. If you come hang out with us in our Santa Monica offices I think you’ll find what the people who visit often comment, “it’s a chill environment and the whole team seems to enjoy hanging out together.” For a taste of our work environment, our portfolio company DroneBase shot some video from our offices in the video below. We invest nationally and search out the best deals regardless of geography. We’ve had billion dollar exists in Chicago, Baltimore, London, San Francisco and Los Angeles an well as enormous winners also in New York and Las Vegas. Just over 40% of our investments are in Greater Los Angeles, 25% in the Bay Area and 15% NYC with the balance in a city near you (Austin, Seattle, D.C., Boston, Finland and Paris). In addition to each of our core funds we raise “opportunity funds” that allow us to follow the full lifecycle of our companies as they get bigger, reach later stages and require further capital. We have written follow-on checks of more than $20 million into a single company from our opportunity fund and scaling to more than $40 million in any one company across our funds. Our goal is to fund you from your earliest stages and as you scale on your way to an IPO. Upfront has long held the view that with regards to equality we should DO more than SAY but the events of the last weeks have led us to want to verbalize more our deep-seated commitment to equality in funding founders across ethnicities, nationalities and genders. We believe this isn’t just a market statement — it is where we will drive huge and differentiated returns. Dating back to Upfront II in 2000 (the single best performing fund in the US for that vintage) 2 of our 3 best returns were driven by companies with female founders / CEOs. 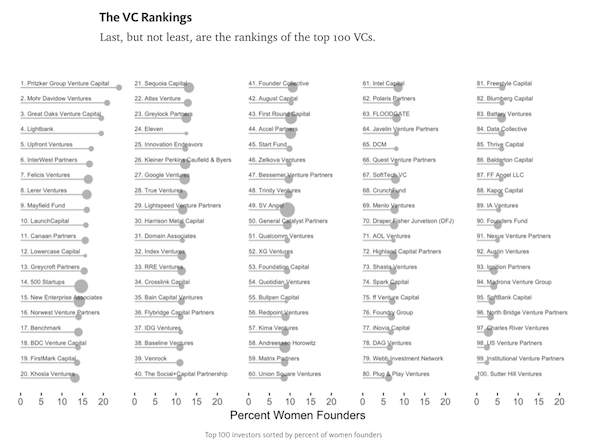 More recently reports have come out listing VC firms ranked by percentage of female founders where we’re usually listed in the top 5% nationally. In our most recent fund ~30% of the companies we’ve backed have had at least one of the primary founders as a woman. In the past 5 years we’ve just made a more active effort to reach out to female founders and as we funded some of the brightest and most ambitious ones we met, unsurprisingly you find you start getting a lot more referrals to their female founder friends. We’ve spent most of this time just doing it vs. saying it. We’ve made investments in our community in LA to renting out movie theaters and screening films on gender bias and chairing discussions about how to improve the work environment in startups. We also bring speakers on the topic every year to talk to the VCs who attend our Summit. Yet clearly we must do more. Our own personal experiences led us to want to solve the gender imbalance in startups yet we are now aware that in addition we need to make sure that the work environment is safe, in particular between VCs and entrepreneurs. And in the coming years I hope you’ll see us DO as much as SAY in this regard. We take this responsibility seriously. I thought I might close with a short video highlighting some of the great companies in LA including some of our portfolio companies, and some of the things that make LA special. Oh, and our favorite Randy Newman song :). Thank you to the entrepreneurs who have entrusted us to take part in your journeys.